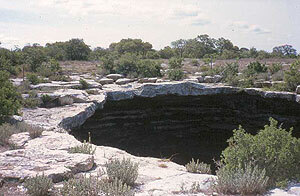 Devil’s Sinkhole. Photo Credit: National Park Service. Click the image to open the Edwards Plateau gallery. Edwards Plateau is located in western Texas and is the southernmost extension of the Great Plains. Bounded by the Pecos River to the west and the Colorado river to the east, Edwards Plateau also borders the Llano Estacado to the north. Although a plateau, much of region is dissected with steep canyons, and caves are common. Area: Approximately 96,770 sq km (37,370 sq mi). Precipitation: Rainfall varies on Edwards Plateau from the northwest to the southeast. The drier portion of the Edwards Plateau is to the northwest and receives as little as 38 cm (15 in) in a year. The southeast, however, receives as much as 84 cm (33 in) per year. Temperature: Highest temperatures are on the southwest portion of the plateau, and the coldest are on the extreme northwest portion, along the Edward Plateau’s border with the Llano Estacado. Summer highs near 100 degrees F are common, as are winter lows in the 40s, with rapid temperature swings of as much as 50 degrees F possible. Elevation: The average elevation of Edwards Plateau is between 250 m (820 ft) and 1000 m (3280 ft). However, canyon bottoms can be as low as 100 m (330 ft). Vegetation: Native vegetation on the Edwards Plateau was primarily grassy savanna dotted with mesquite, juniper, and live oaks; however, livestock grazing has largely displaced the native vegetation. Geology: The Edwards Plateau lies entirely on limestone bedrock and was a source of high-quality chert, or flint, for prehistoric people. Edwards Plateau is often called the “Texas Hill Country” because the highly erodible limestone has been cut by streams and rivers into a topographical landscape of steep hillsides and valleys. Caves are also common. National Parks: Big Bend and Rio Grande are nearby.